The smaller Angelfish species work well in larger reef tanks, however the larger species, such as the Emperor Angelfish (Pomacanthus imperator) will eat corals and shrimp and should be avoided. Even the smaller (Dwarf) Angels will occasionally pick at corals in a small tank unless they are well fed. The beautiful Japanese Swallowtail Angelfish is one of the few truly reef tank safe Angelfish which does not bother corals or other invertebrates. The Swallowtail Angelfish is a "mid water column" fish, meaning that, in the wild, it does not live on the reef or on the surface, but in between, feeding on plankton, for the most part. The Swallowtail Angelfish is truly a reef safe fish, and is number one at the top of our list. This angel is naturally a planktivore, and often browses on diatom and filamentous algae in aquariums. Having this fish in our 92g reef tank, it has never bothered any of our soft and stony corals. Learn more by reading the "Personal Notes From Your Guides" section we have included in this fish's profile. The Swallowtail seems to get along with just about every other fish in an aquarium. The Coral Beauty is a favorite Genus Centropyge Dwarf or Pygmy Angelfish species for aquariums due to its brilliant colors, hardiness, low price and ready availability. The colors of the Coral Beauty can vary in intensity and hue, depending upon where it was collected from in the wild. Unlike larger angelfish, the colors of the Coral Beauty Angelfish do not fade as they get older. This fish is normally not as aggressive as many other Angelfishes, but some individual specimens may be territorial in smaller aquariums, particularly if they have been in the tank for a while. This fish may occasionally nip at clam mantles and large-polyped stony corals, particularly if kept in small reef systems. However, we have found that if the fish is well fed and has plenty of live rock to pick at to keep busy, they seldom cause damage to corals. One of the smallest Genus Centropyge Dwarf or Pygmy Angelfish species, the Fisher's Angel is normally not as aggressive as many other Angelfishes, but some individual specimens may be territorial in smaller aquariums, particularly towards more docile fish. The Fisher's Angelfish is best kept in a well established live rock aquarium with ample algae growth present for grazing, and provided with lots of shelter. Does well in tanks with diatoms or brown mircoalgae. It is possible to keep a male-female pair or even a trio (one male-two females) of Lemonpeel Angelfishes in the same tank together, provided that it is a large aquarium with plenty of hiding places, and they are introduced into the aquarium at the same time. This species is well known for picking at large-polyped stony corals, and tridacnid clam mantles. 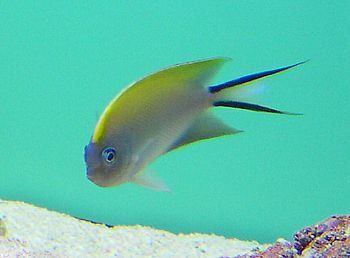 The Lemonpeel Angelfish may also eat some soft coral polyps, as well as pick at zoanthids. Therefore this fish, as true with most all Angelfishes, cannot be completely trusted if these invertebrates are present. This beautiful Angelfish is considered to be semi-aggressive, particularly in a smaller tank where its territory is challenged. Considered reef tank safe with caution, it may nip at clam mantles and stony and soft corals. A larger tank may help mitigate the damage. One of the larger Genus Centropyge Dwarf or Pygmy Angelfish species, the Eibl's Angelfish adapts well to a peaceful aquarium environment with plenty of hiding places, but individuals may act aggressively towards smaller fish, particularly when confined in a small aquarium. One of the more docile of Angelfish species, it does have a tendency to be aggressive towards other fish that have been introduced into the aquarium once it has become established. Although touted by aquarists to be a fairly good reef safe fish, it may nip at large polyped stony corals, Zoanthids, Tridacnid Clam mantles, and even some soft coral polyps. If kept in a reef tank with plenty of algae to graze on to keep it occupied, it should leave most corals alone. What Do Reef Corals Need to Survive?